1 Owner! Does have a minor accident with animal. Clean Title. Loaded with power heated front seats, a heated steering wheel, tri-zone automatic climate control, Intelligent Key, Bluetooth and push-button ignition 8-inch wide-format touch screen and controller for the Navigation System, Real-Time Traffic Information, XM Radio, Weather and Zagat restaurant data. Moving Object Detection system (MOD) and it incorporates an Around View Monitor that uses four super wide-angle cameras and can display the view 360 degrees around. 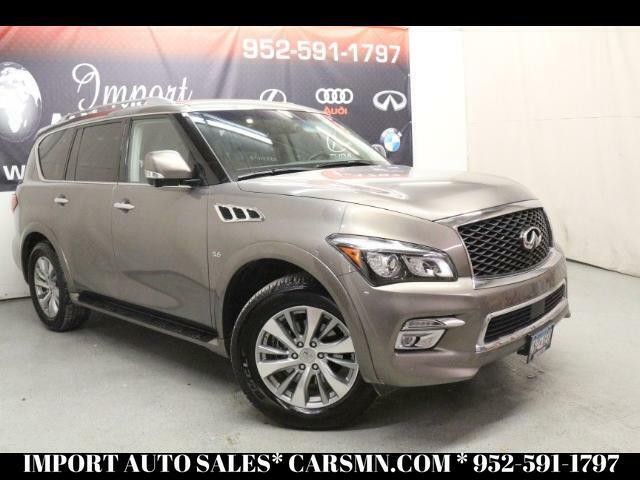 The QX80 is a large luxury truck that is both elegant and comfortable, yet its body-on-frame layout allows a tow rating of up to 8,500 pounds. Ride comfort and handling are also quite good and the big 5.6L V8 and 7-speed automatic make an agreeable pairing, with strong responsiveness. Three rows of seating, which makes the QX80 a good pick for families. Inside, the cabin is a standout, with a quiet, refined feel, lots of standard and available technology, and great ride quality. Inquire Online or Call Us at 952-591-1797 Great Financing is Available and Trades are Welcome! !